We are lawyers serving clients all across West Virginia. Our main areas of practice are: Wrongful Discharge / Termination / Firing, Car and Truck Accidents (Motor Vehicle Collision / Wreck), Coal Mine Accidents, Wrongful Death, School Law, and Personal Injury. We have extensive experience in employment law and personal injury in West Virginia. We provide representation to victims of coal mine and other industrial accidents. We also represent people who have been injured in motor vehicle accidents. 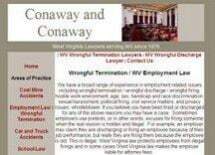 Our firm represents workers who have been wrongfully discharged or wrongfully terminated from their jobs. We serve clients in all locations in West Virginia including, but not limited to, Boone, Raleigh, Kanawha, Logan, Wood, Lincoln, Mercer, and Mingo County, WV. Our office is approximately 25 minutes south of Charleston, WV and located right next to the Boone County Court House.